Change has become a constant in our work lives. Old methods are increasingly challenged by new approaches. Competitive pressures compel us to redistribute scarce resources; to do more with less; to deliver continuous improvement. Employees often feel that they have no voice in the establishment of organizational goals and plans. They struggle to co-operate while working with incomplete information and individual agendas. In many cases, organizations emphasize process and product evolution at the expense of their people. Consequently, managerial pressure and change agendas frighten employees rather than inspiring them. The employees start to defend the status quo instead of innovating and growing. Your organization - be it large or small � stagnates. We can help. 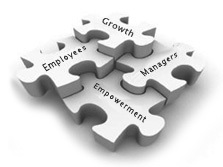 Working with you and your employees, we can develop adjustment plans which empower people. We can get your people ready for new challenges without fear of the future. We can encourage growth in your organization and confidence in your staff.